I previously posted a way to generate PAT files from an exported DWG file. One of the comments to that post gives a great alternative method – so unique it actually made me smile. You may have noticed that when you export a DWG file, Revit temporarily creates PAT files in the export folder, and then it deletes them, just leaving DWG and PCP files. To recover the deleted PAT files, you can simply use the program Recuva! I’m not sure how well this works for network shares or NAS devices, but it should definitely work if you export the DWG to a local drive and immediately recover the PAT files (before doing anything else). Autodesk Impression 3 has been readily available for some time now. But would you like to know how to turn your Revit drawings into ‘sketchy’ looking plans? 4) Open AutoCAD and open the file you just exported. 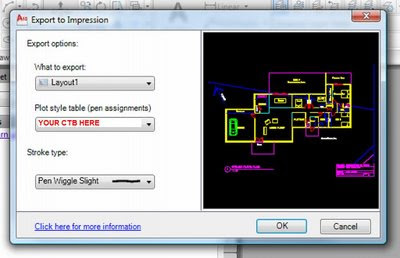 5) In AutoCAD, type ‘STYLESMANAGER’ – this opens the location for all your CTB files. 10) Choose a filename for the new CTB file that you have createdOkay, now we go back to AutoCAD and export Impression. I found that the scaling was simpler direct from AutoCAD, rather than trying to put the DWG file straight into Impression. 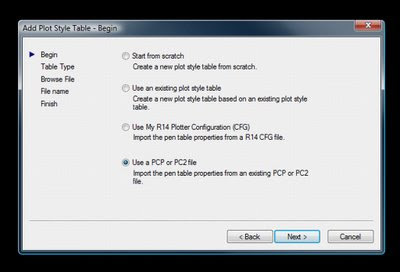 13) Choose your CTB under ‘Plot style table’14) I like the ‘Pen Wiggle Slight’ for ‘Stroke type’15) Hit ‘OK’ – Autodesk Impression will now open, and your file will look sketchy! !16) You could do more work in Impression, or you could just hit ‘File – Save As…’17) Choose PDF (if that’s what you like), then under Resolution, choose ‘Custom’ and type 300 dpi if you want decent quality. Type your File Name and hit OK.There you go! It seems like a lot of steps, but once you have done it a couple of times, you will very quickly be able to convert your Revit floor plans into sketchy drawings for presentation!These can be very useful early in the design process – if your drawings look ‘sketchy’, the Client may feel like you haven’t resolved everything without consulting them. Therefore, the Client may feel that you care more about them and their ideas. Check out this link for some examples.